RAIDS Online uses Google Maps to display crime data in the USA. Currently police departments in Arvada, CO, Cincinnati, OH, Durham, NC, Lewiston, ME, Missouri City, TX, Pembroke Pines, FL, Rochester, NY, Topeka, KS and Whittier, CA have signed up to share their crime data with RAIDS Online. 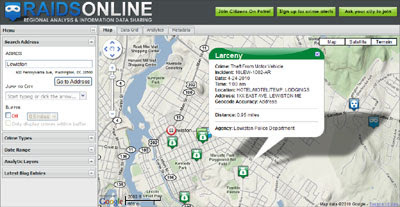 Using the map it is possible to view crime type, street-level address, address name and the date and time of the crime. Filtering capabilities include: address search, buffer, and date ranges. Users have the ability to create heat maps based on the data in their current view. This is particularly useful in visualising crime hotspots in a particular area. As well as the maps interface it is possible to view graphs of crime trends. The graphs automatically update based on the data that is displayed on the map, giving the user full control over what data they would like to analyse.